The best pictures of dinosaurs show flying animals, herbivores and carnivores. The first picture of a dinosaur shows the exotic flying animal called the Archaeopteryx. 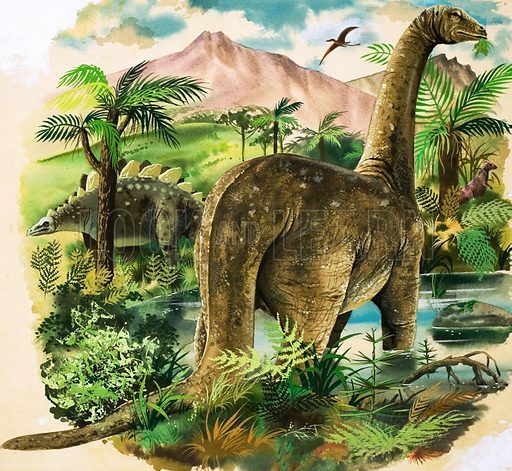 The second picture of dinosaurs shows a Brontosaurus and a Stegasaurus in a swamp. 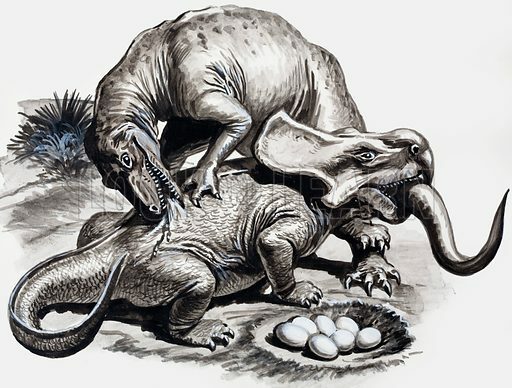 The third picture of dinosaurs shows the Tyranosaurus Rex eating its prey. 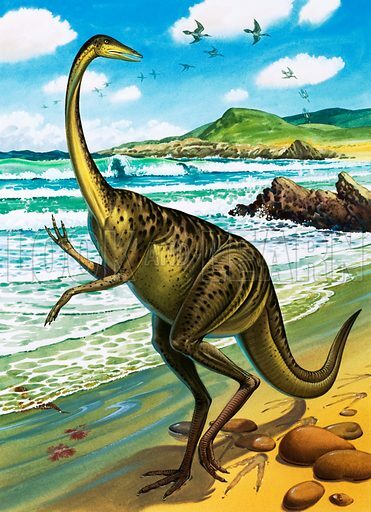 Many more pictures of dinosaurs can be found at the Look and Learn picture library. This edited article about dinosaurs first appeared in Look and Learn issue number 544 published on 17 June 1972. The great dinosaur ‘rush’ across the immense fossil fields of America which had led to some of Man’s most exciting discoveries about monsters of the earth’s past, had begun to die down by the turn of the century. Apart from Barnum Brown’s bonanza of dinosaur remains at the beginning of the twentieth century, one more outstanding discovery on the North American Continent was yet to come. 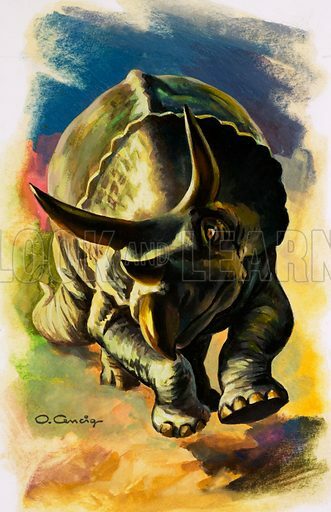 In 1913 one of the horned dinosaurs, Styracosaurus, was found by L. M. Lambe in the State of Alberta in Canada. This monster, which weighed three tons had a huge nasal horn and a neck frill armed with six spines. Like those of the Triceratops and Monoclonius, the horns of the Styracosaurus provided an effective defence weapon. Armed with these, the horned dinosaurs were able to hold their own against some of their most powerful and fierce enemies. There were other discoveries in North America at this time. The Sternbergs, father and sons, carried on the work of the real pioneers who had led the great search for dinosaurs in America, Cope and Marsh. But the North American Continent was not the only rich storehouse of dinosaur remains in the world. Africa yielded wonderful results. Other parts of the world south of the equator also gave up their long, buried secrets, but most of these discoveries were only a repetition of those which had been made in North America. One exception is the expedition organised and financed from the United States, to Eastern Asia, across the vast empty space of desert scrub and grassland of Mongolia and the Gobi Desert. Curiously, these expeditions to Mongolia were planned with another end in view. 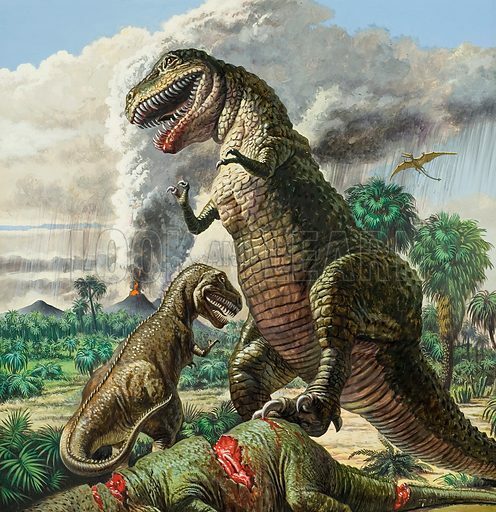 Dinosaurs were no part of the plan at all. At the turn of the century a theory was put forward which suggested the possibility that Mongolia was the area where Primitive Man and mammals made their initial bow. That it could, in fact, be the birthplace of modern life. This edited article about dinosaurs first appeared in Look and Learn issue number 543 published on 10 June 1972. In the summer of 1893, a young American student at the University of Kansas named Barnum Brown led a fossil hunt through Nebraska and South Dakota. Whether this expedition was successful or not was never stated, but the ones which followed it certainly were. For in the following summer Brown led another fossil hunt, this time through Wyoming, where he unearthed a skull of the Tricerops. Remains of this creature had been found before by Charles Marsh, who, together with Edward Cope, had led the great Dinosaur ‘rush’ of America. But for a young, inexperienced student, such a discovery was quite a feat. After graduating in 1897, Brown became associated with the American Museum of Natural History and was immediately sent on an expedition to Wyoming to collect dinosaurs. This was the beginning of his long and successful career in dinosaur-digging, during which he was to become one of the greatest discoverers of dinosaurs in America. Although he had collected many fossils, not only in the United States, but throughout the world, dinosaurs were Brown’s chief joy. It was often said by those who had assisted him on his expeditions that he could almost ‘smell’ them out. The imposing collection of Cretaceous remains in the American Natural History Museum, which he served until his death in 1963, is a wonderful monument to his life’s work. One of Brown’s greatest and most exciting discoveries was in the Howe Quarry at the foot of the Big Horn Mountains near Yellowstone Park. In 1934 a rancher named Barker Howe had reported a find of huge bones on his ranch and Brown was sent to investigate. He found what could almost be described as a dinosaur quarry. Bones were breaking through the surface of the ground, having weathered their way through the soil. This edited article about dinosaurs first appeared in Look and Learn issue number 542 published on 3 June 1972. After the discovery of Iguanodon remains at the Bernissart coal-mine in Belgium in 1878, there followed what can only be described as a great dinosaur “rush” in America. Dinosaurs were no longer a myth. They lay buried deep in the earth and were simply waiting to be discovered. The frantic search for dinosaurs on the North American continent was soon begun though no one could have known just how many exciting fossil finds lay in store for the American pioneers of palaeontology. For a quarter of a century, between 1870 and 1895, two of the most famous of these pioneers, Charles Marsh and Edward Cope, opened up the way to the immense fossil fields of the American West. Both men were ardent palaeontologists, both had inherited vast fortunes, and both were to transform palaeontology into a dynamic science by charging it with an exciting and adventurous spirit of discovery. The expeditions which they carried out were beset with difficulties from the start. Enormous distances had to be covered over trackless terrain, and once unearthed the gigantic heavy fossils had to be transported with great care to the nearest railway stations in rough rattling wagons. 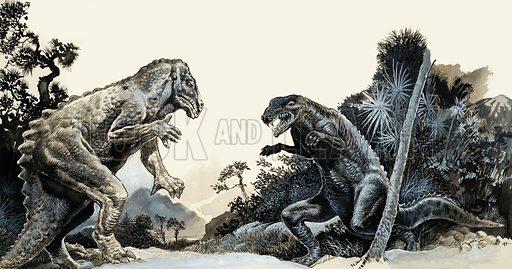 Instead of combining forces to form a dinosaur-digging team, Marsh and Cope became bitter rivals, each trying to outvie the other until their respective expeditions became nothing less than a fantastic race; a competition to see who would discover the most exciting, and the greatest number of, remains. Unlike the earliest discoveries made in the United States during the 18th century in which a single bone was dug up in one area, and a different one dug up in another, the finds of Marsh and Cope were on a very grand scale. In one area the remains were so plentiful that a cabin was built out of them. This was called Bone Cabin and eventually became the headquarters of the dinosaur “dig” in that area. South of Bone Cabin was Como Bluff, a long ridge in South Wyoming which runs parallel with the Union Pacific Railway. In 1887 two railroad men stumbled on a great mass of fossilised bones which they passed on to Marsh. Como Bluff soon revealed its long-hidden secrets. Complete skeletons of Jurassic dinosaurs, including a fine specimen of Stegosaurus, were unearthed. This edited article about dinosaurs first appeared in Look and Learn issue number 541 published on 27 May 1972. Dean William Buckland had good cause to look astonished when he dug into a slate quarry at Stonesfield and found what he could only describe as the remains of a giant lizard. A set of the most unusual teeth he had ever seen attached to a massive jaw, part of a pelvis, a section of a shoulder blade, and several large backbones were all part of a giant skeleton which must have once belonged to some grotesque monster of prehistoric times. Dean Buckland worked out that the creature must have measured fifty feet long and eight feet high, classified it as a reptile, and gave it the name of ‘Megalosaurus’. Remains of such creatures had been found before this discovery which was made at the beginning of the 19th century. The first hints of these long-buried monsters of the past had been found in various parts of the U.S.A. A bone dug up here, a footprint found there, but there had never been enough evidence to establish the fact that dinosaurs had ever really existed. No records were kept of these first discoveries such as the thigh bone found in New Jersey in the 18th century, or the giant rib discovered on the south bank of Yellowstone River in 1806. These early finds were virtually ignored. Prehistoric monsters were found only in fairy tales, they surely had never existed. But had they? The work of two English pioneers in dinosaur discovery did much to refute such an attitude. Dean Buckland, the geologist who had found parts of the giant skeleton of the creature he named Megalosaurus, and Dr. Gideon Mantell were to become the founders of modern palaeontology, and to provide irrefutable evidence of the existence of such monsters. In March 1822, Doctor Mantell and his wife were visiting a patient in Lewes, Sussex. It was here that the second dinosaur remains to be found in England were discovered by accident in a pile of rubble which been put aside for road repairs. Mrs Mantell had noticed something glinting in the rubble heap, and when she and her husband went closer to investigate they found that the glint came from some fossilised teeth embedded in a piece of stone. His curiosity aroused, Dr Mantell returned to the site for some weeks afterwards and, to his great delight, found not only more teeth, but also a number of large fossilised bones, none of which he could identify. This edited article about dinosaurs first appeared in Look and Learn issue number 499 published on 7 August 1971. In the summer of 1922, a party of scientists, led by Robert Chapman Andrews, an explorer, were slowly making their way in trucks and cars across the great Gobi Desert of Outer Mongolia. They were members of the American Central Asiatic Expedition, whose object was to make a natural history survey of the Gobi. A thousand miles of desert salt basins, lone scrub and rolling ridges make up the Gobi, which has always been a formidable barrier to exploration. The ancient caravan trail could only skirt the fringes of this vast wasteland. It was not until the end of the last century that men dared to leave the caravan routes to explore the unknown interior. The American expedition had travelled 800 miles into the Gurban Sayhan district of South Gobi, when they came to some sandstone cliffs known as the Flaming Cliffs of Djadochta. As the scientists tumbled from their vehicles to begin surveying, little did they know what momentous discoveries lay ahead. Searches along the face of the cliffs led, before long, to the discovery of the bones of a 7 ft. dinosaur, unknown at that time. Later it was to be recognized as the now world-famous Protoceratops, the ancestral grandsire of all the mighty horned dinosaurs. Exciting as was this discovery, it was soon overshadowed by a member of the expedition who found three petrified eggs sticking out of a sandstone ledge. Under the shelf, the ends of two more were spotted. The whole slab of weathered sandstone contained a nest of dinosaur eggs, 13 in all. They had been laid in two layers, like turtle eggs, their rounded ends facing inwards. 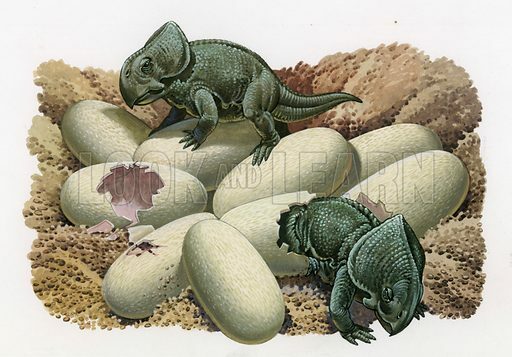 There they were, looking as they must have done when the female Protoceratops had left them buried in the sand 95 million years earlier. This edited article about prehistoric animals first appeared in Look and Learn issue number 498 published on 31 July 1971. The world has not always been as it appears today. Were we able to travel back in time for 600 million years, the continents and seas would be completely unfamiliar to us. The largest land mass today is Eurasia, stretching half way round the globe, with one arm pointing towards America and a broad leg thrust down into Africa. Yet this huge continent was, 600 million years ago, an archipelago of large islands that rose slowly from the sea to merge into the super-continent of Laurasia, a great land mass that extended right across the world to include North America. According to many scientists, who hold to the idea of drifting continents, Laurasia formed the northern block of a world continent, partially divided in the middle by the Tethys Sea. The southern half of this land mass was called Gondwanaland, which consisted of South America, Africa, India and Australia. This condition existed in the Carboniferous Period, 230 million years ago. Opinions are divided as to when the separation of the continents began; some think as early as the Jurassic times (170 million years ago). Others believe it was much later in the Cretaceous times, 135 million years ago, that the first cracks appeared in the world’s structure. Of course these movements were so slow that no living thing would have noticed them. In fact, many think that it was only in the Pleistocene Epoch, around a million years ago, that the rift between Africa and South America widened enough to become the Atlantic Ocean. The drifting of the continents, caused by complicated movements of convection currents beneath the earth’s crust, have had much to do with orogeny (mountain building) and it is clear that, during the earth’s long history, several driftings have occurred before that, originating in the Tertiary Era. There are two recognised directions in which these movements have taken place – westwards, when the Americas separated from Africa, and later from Eurasia. This caused the folding and upthrust of the Andes and the Rocky Mountains, and secondly, the movement towards the equator by Eurasia from the north and Africa and India from the south. This enormous pincer movement squeezed up the Atlas Mountains in Africa and the Alps and Himalayas in Eurasia. It is thought that older mountain ranges were brought into being by other driftings in the even more distant past. Two features persisted over a very long period. They were the Tethys Sea (which separated Europe from Africa, and India from the main body of Asia), and the much narrower Uralian Sea that flowed down from the Arctic to join the Tethys and divided Europe from Asia. It was not until 36 million years ago, in the Oligocene Epoch, that the great Tethys began to regress from Eurasia so that all that remains of it today is the Mediterranean and the inland seas of Caspian, Aral, Azov and the Black Sea. The narrower sea of Uralia also dried up and from then on Europe and Asia have been one continent. This edited article about prehistoric animals first appeared in Look and Learn issue number 497 published on 24 July 1971. Everything seemed to go haywire on earth 60 or 70 million years ago. During this broad span of time, the sea which split North America into two islands drained away. A tremendous surging from the bowels of the earth erupted as glowing, crimson lava which cooled to become the enormous range of mountains we know as the Rockies. North America was still joined to the British Isles by way of Iceland. Truly, the map makers would have had some amazing changes to record. But the most amazing changes would have been noted by the zoologists. They would have had an unsolved mystery to ponder over. 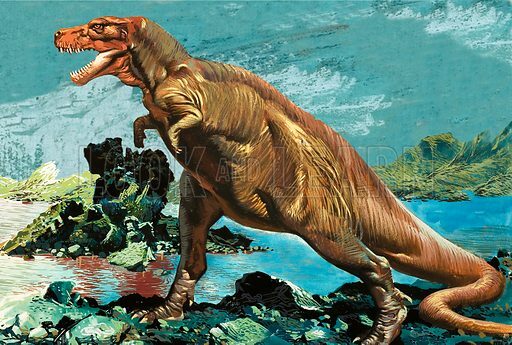 For, in this period, the lumbering, extraordinary dinosaurs, that had been the kings of the earth for over a hundred million years, rose to the height of their power and variety . . . and then, suddenly they became extinct! Perhaps the shake-up the world had undergone created conditions in which they could no longer exist. 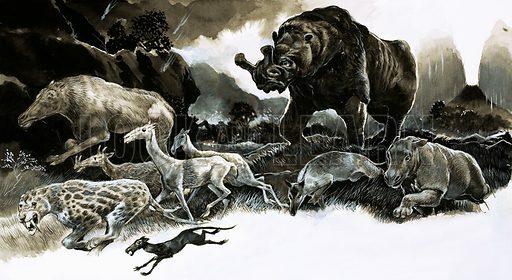 Whatever the reason, their end brought the Mesozoic era to a close and opened the way for the New-life (or Cenozoic) era, which has come to be known as the age of mammals. Palaeontologists (people who study extinct life) have divided the Cenozoic into several epochs, the last of which is the Holocene, the times in which we now live. For many millions of years before the great reptiles became extinct, the ancestors of the mammals had been in existence. They were mostly small animals, not much larger than shrews or rats. Living under the feet of the savage reptiles helped to sharpen their wits, enlarge their brains and (since they were warm-blooded and able to stand greater changes in temperature than were the cold-blooded dinosaurs), they could live in conditions of cold that the reptiles were unable to stand. So it came about that when the dinosaurs died out, the mammals were fitted to take their place and expand into every corner of the earth. This edited article about prehistoric animals first appeared in Look and Learn issue number 496 published on 17 July 1971. Many scientists today think that the continents of the world were once united into one or two super-continents and then, in the distant past, they broke apart to drift into their present positions. As these movements took millions of years to accomplish, the changes would not be noticed; in fact, some scientists think that this drifting is still going on, with New York moving away from London at the rate of a fraction of an inch a year. Over the vast ages of the earth’s history, the landmass which is now North America has been subjected to many changing patterns of sea and land. Great transgressions – or invasions of the sea – have from time to time flooded huge areas of the land, only to retreat – so that what is now dry land was once a wide deep sea. North America has been the scene of some of the most important stages in the evolution of life, and the fossils of these stages have been excavated from the rocks of Greenland and the Red-beds of Texas. The discovery in 1931, by Dr. Lauge Koch, of the remains of the Ichthyostegids, caused great interest in scientific circles, because here at last was the evidence proving beyond doubt that all land-living creatures had evolved from a group of fishes known as the “Lobe-fins,” which possessed fins on the way to becoming limbs or fingers. The Ichthyostegids had all the in-between features required for the missing-link that marked the transition from fish to mammal. Thirty years before the discovery of the Ichthyostegids, a Dr. Watson uncovered the fossil fragments, and later the complete skeleton, of an amphibian-reptile. These were found in the Texan Red-beds near a town called Seymour, and so came to light the famous Seymouria, the linking form between the amphibians and the reptiles. Although Seymouria was too late in time to be the actual ancestor of the reptiles, it resembled the form that had been. For instance, it had the skull, teeth and parts of the backbone typically amphibian, while the limbs, shoulder girdle and jaw were those of a reptile. This edited article about Prehistoric animals originally appeared in Look and Learn issue number 405 published on 18 October 1969. The Triceratops is perhaps a better-known member of the same family as the Styracosaurus, that rhinoceros-like mighty horned dinosaur. This awesome creature was probably about 30 ft. long and its skull alone measured about seven feet. It had three powerful and wicked-looking horns – the nasal horn and two others, one above each eye. It also had an enlarged rostral bone, like a curved beak, just above the mouth. It must have been a most terrifying opponent. Indeed, its appearance alone would have been enough to paralyse with fright almost any creature alive today. It may have been possible to attack triceratops from behind but even so the area around the neck, which might be thought to be the most vulnerable, was more than adequately protected by an enormous frill, covered with a thick skin like armour-plating. Triceratops was a land reptile but even in the air, the weak were by no means safe. 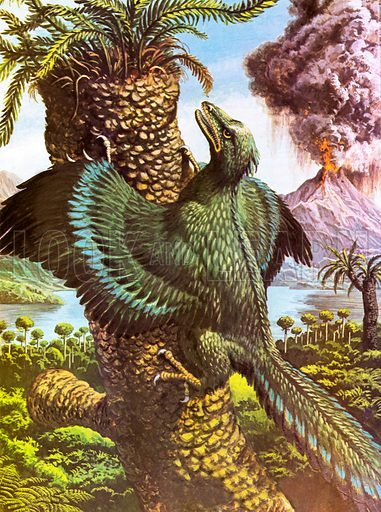 At one time there were some really enormous flying reptiles. There was, for example, Pteranodon. This strange bird-like animal had huge jaw-bones which formed an immense toothless beak. The head was provided with a bony crest of considerable length and the shoulder blades were fixed to the backbone, so giving the necessary strength to enable the wings to support the creature’s great weight. 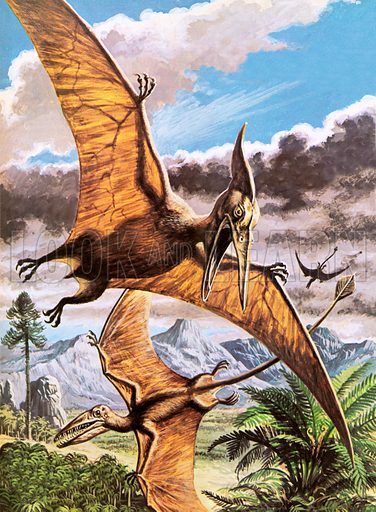 The wingspan of some types of pteranodon was 25 ft. and, although this is extensive, it is probable that pteranodons, on the whole, were not very adaptable in flight and were liable to all sorts of accidents. Their hind limbs, too, were obviously very weak so that it is doubtful if they could rest on the ground with any comfort. Some people think that they may have rested with their heads hanging downwards like bats, although this is not known for certain. The creatures of the sea also were multitudinous and extremely alarming in aspect. For example, there was Plesiosaurus. This creature had very sharp, pointed teeth along the edges of the jaws and none on the palate. As a result, it was highly adapted for catching fish, since the mouth itself was virtually a fish trap. Some plesiosaurus had long necks and rather small, triangular-shaped heads. Others had somewhat long skulls and their necks were rather short. The tail, although strong and muscular, was not particularly long, since the limbs were in the form of flippers and must have enabled them to propel themselves through the water with great efficiency. Some Ichthyosaurs had long, rather delicate skulls. Their jaws contained a great number of small teeth which were probably used for crushing the molluscs which made up their food. Some of the early fishes of the seas were undoubtedly eaten by these ferocious marine reptiles. Among them must have been the fairly small Teleosts, the ancestors of the modern angelfish and the Belemnites, the ancestors of the modern squids and cuttlefish. The Lamnoid Shark and the Pristid-sawfish were themselves quite large and ferocious and were probably comparatively free from predators. But imagine what it would be like if the sea in which we bathe so happily were still inhabited by these frightening monsters. . . ! Fortunately, they ceased to exist long ago.